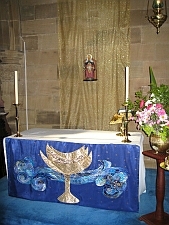 St Mary’s Church has not always had a Lady Chapel. From its beginnings in 1838, St Mary’s had always been staunchly evangelical. Maitland’s early settlers lived by a high moral code which included regular church attendance to receive Holy Communion and hear the Word of God. The Lord’s Table and the Pulpit were the two most important items in the Church. St Mary’s continued to be evangelical until the 1930’s when many changes were taking place in the Anglican Church. Candles, incense and priestly vestments began to appear. In 1986 St Mary’s was visited by Mr John Maitland, the Secretary of the Clan Maitland in Australia at that time. He offered a copy of the Statue of Our Lady of Haddington for a Lady Chapel to be established in St Mary’s. The original statue is in the Maitland Family Chapel in St Mary’s Church, Haddinton, Scotland. The statue thus forms a link between St Mary's Church Haddington, the Clan Maitland and St Mary’s Church, Maitland. 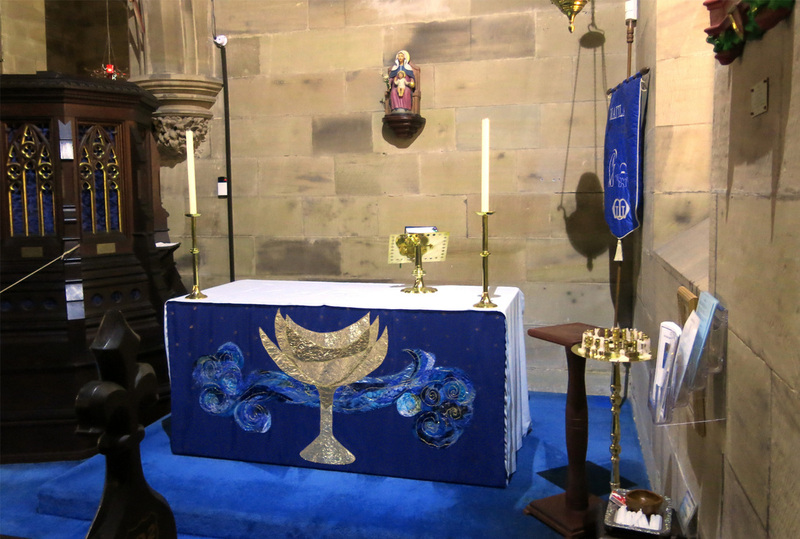 The Altar Frontal and Chasuble for the Lady Chapel were given in memory of John Leslie Craft by his family. They also are the work of Jan Clark.